We receive a lot of requests for wedding cakes and Christmas cakes of varying sizes. So, using Delia’s Rich Fruit Cake, we have calculated the ingredients list and cooking times for you. This scaling up is more difficult with cake recipes – they cannot simply be doubled or tripled. However, as a general rule, square tins hold about 25 per cent more than round tins of the same size. The cooking temperature would be the same, but it might take longer to cook, and it’s a good idea to turn the cake tin round in the oven a few times after it has had its first 4 hours (or 3 hours for a 6 inch / 15cm cake) because the corners tend to cook faster than the middle. Grease the tin and line with greaseproof paper. Pre-heat the oven to gas mark 1, 275 F (140 C). Click here for information about cooking with gas mark 1. 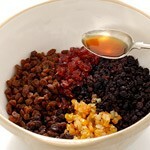 The night before you make the cake, place all the dried fruits and peel in a bowl and mix in the brandy. Cover the bowl with a cloth and leave to soak for at least 12 hours. It is quite a good idea before you measure the treacle to place the tin in the warming drawer of the oven, so that it melts a little, which makes things easier. Sieve the flour, salt and spices into a large mixing bowl, and in a separate bowl cream the butter and sugar together until the mixture’s light and fluffy (this, in fact, is the most important part of the cake, so don’t cut any corners). Next, beat up the eggs and – a tablespoon at a time – add them to the creamed mixture, beating thoroughly after each addition. If it looks as if it might start to curdle, you can prevent this happening by adding a little of the flour. When all the egg has been added, fold in the flour and spices (fold, don’t beat). Now stir in the fruit and peel that has been soaking, the nuts, the treacle and the grated lemon and orange rinds. Tie a band of brown paper around the outside of the tin, and cover the top of the cake with a double square of greaseproof paper (with a hole in the middle approximately the size of a 50p). Bake the cake on the lower shelf of the oven, look at the table above for baking times, and don’t open the door to peek at it until at least 4 hours (3 hours if making the 6 in (15 cm) round cake) have passed. When the cake is cold, wrap it well in double greaseproof paper and store in an airtight tin. I like to ‘feed’ it at odd intervals with brandy during the storage time. To do this, strip off the lining papers, make a few extra holes in the top with a thin darning needle and pour a few teaspoons of brandy in to soak into the cake. Repeat this at intervals for a week or two.